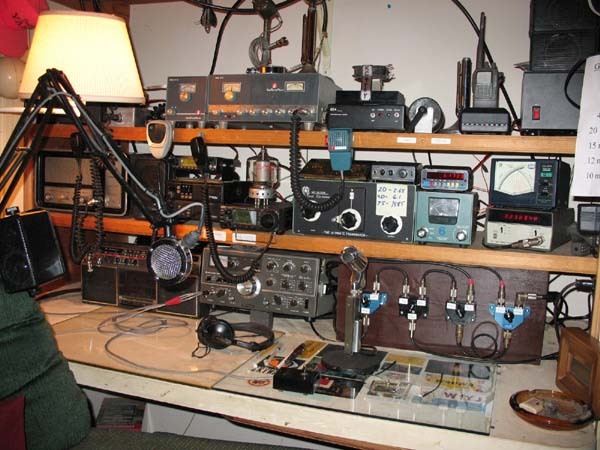 This is the main radio bench in the shack. The top shelf has 2 Astron 12 volt supplies on either end, behind the lamp shade is a RS-20 and on the right side is a RS-35 I had to add after I found that the 20 amp supply would not run the new IC-706 along with everything else. with (very drifty) matching VFO feeding a solidstate 10 in 80 out brick amp. Next to the brick is a coax switch to select between the SR-46 and the IC-706 going to the Halo antenna. Next to the 6 meter brick is my Icom dual band HT in it's drop in charger. On the second shelf is a 6 meter FM rig made by Hammarlund and marketed by OuterComm located in Charlotte NC. Next is a small stack with an Icom 229H that's mainly used to monitor the local fire channel on top with a Motorola GM 300 commercial UHF 2 way radio that's programmed for the local repeaters. Below it is a GM 300 receive section that's setup to receive a signal from my 440 HT and feed it into the transceiver and key the transmitter. This was I can walk around the house with a HT on low power and transmitter through the the GM 300 to the local repeater. I listen to the repeater directly on the HT. Next to the 706 is a Murch UT-2000 roller inductor antenna tuner that tunes the G5RV Hf antenna. Next to the tuner is a HeathKit HM-2102 VHF SWR-Watt meter that's connected to the 6 meter Halo antenna. On top of the HeathKit meter is one of 2 freq counters in the shack, next to it is the other counter and HP that's under a Daiwa cross needle SWR-Watt meter that feeds the HF tuner. that makes it easy to switch between the different radio. Hanging in the air in front of the station is a modified D-104 head mounted to a recycled desk lamp arm. This feeds both the 520s and the Johnson Viking 2 AM transmitter. There's a small black box with a push to talk switch on a long cable for the Kenwood 520s. 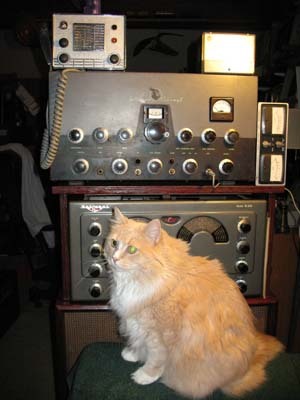 Here's another view of the Vintage AM station with my number 1 assistant operator Sugar the cat. CB radio and a RCA line voltage monitor. That's SWR/Watt meter sitting to the side on it's side.